We Specialize In Trenchless Technology Underground Water and Sewer Service Line Replacements, Installations, and Repairs for areas of Northern Virginia. 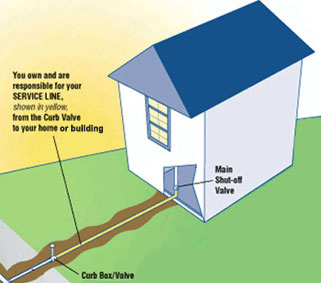 What can cause your water line to suddenly leak? Clues that a leak is occurring. What should you do if you perceive a possible leak? Contact water line replacement specialist ASAP. Ignoring a potential water line leak may result in extensive and expensive damage to your driveway and home. Contact Interstate Enterprises, Inc.‘s 24 Hour Emergency Line at 703-250-8830 or 301-469-7859. We offer replacement of underground water supply lines that have failed due to normal wear and tear. Did you know that if the water pipe leading from the curb to your house should leak or break, you are responsible for repairing it? Has your water bill risen suddenly? Have you noticed a puddle developing in your yard for no apparent reason? If so, you may have a leaking or broken water line. Most people don't realize that this water line – which runs from the public water main on the street to their home or building is their responsibility. This line can range from 20 feet to more than 200 feet depending on your property. Over time, unpreventable environmental conditions may cause your water line to deteriorate and/or crack. Water line failure occurs throughout the year, however, it is most common in the winter months when lines are subject to freezing temperatures. When a leaking or broken outdoor water pipe occurs, a rapid response can prevent thousands of dollars worth of water damage to your driveway, home or building. In addition, contaminated water has the potential of entering your home or building. 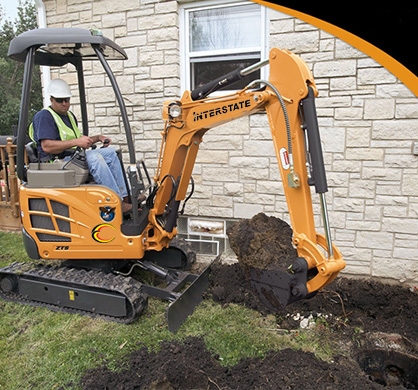 We specialize in quickly and efficiently repairing and/or replacing underground water lines. Our professionals will have clean water running back into your property in no time. Interstate Enterprises – look to us for quick, quality water line replacements! Copyright © 2010 Interstate Enterprises, Inc. All rights reserved.